To you want to bring some peace where ever you go? Try wearing this t-shirt and things may get peaceful. 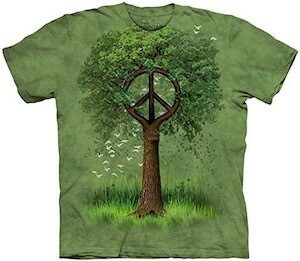 This green hand dyed t-shirt shows a green patch of grass with white birds flying around and a tree and the branches of the tree form the peace symbol. Nature is often very peaceful and when you add the peace symbol to it then things really get good and maybe people will become more peaceful to. So bring some peace by wearing this t-shirt that comes in sizes Small – 5XL and is made from 100% preshrunk cotton to give it the perfect feel and fit you want. Bring peace by wearing hit Roots Of Peace T-Shirt.